Contrary to popular belief, orchids are not difficult to grow as houseplants. However, these exotic plants have different cultural needs than most varieties of houseplants. Prematurely wilting flowers are frequently a sign of incorrect growing conditions that affect the overall health of the plant. Providing the proper care encourages the growth of healthy foliage and abundant blossoms. Inadequate growing conditions can cause orchid blossoms to wilt. Depending on the variety of orchid, the average blossom season lasts one to two months. During this time, numerous buds open and wilt until the end of the blossoming season. 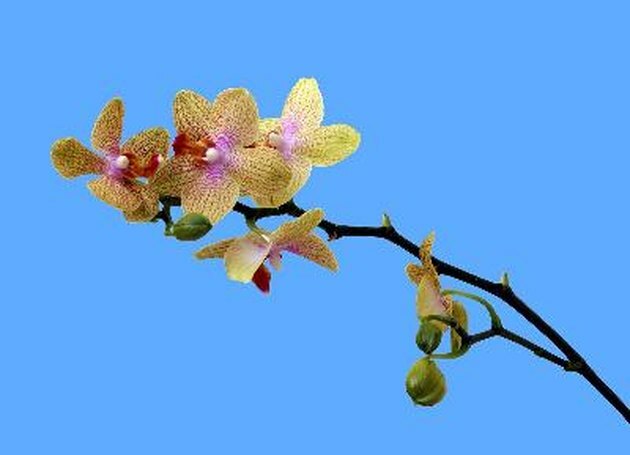 Some varieties, such as Phalaenopsis, produce a continual supply of blossoms for a period up to three months. Most varieties produce new blossoms the following year although some orchids bloom two or three times each year. Negligence can cause plants to stop flowering prematurely or wilt suddenly. Orchids need a controlled environment to produce healthy blossoms. Nighttime temperatures between 55 and 65 degrees Fahrenheit are ideal for orchids, while daytime temperatures between 65 and 75 degrees Fahrenheit provide the best environment for orchids. These plants prefer about a 10-degree difference between the daytime and nighttime temperatures. Orchids require at least eight hours of sunlight each day. Inadequate light is one of the main reasons for depleted blossoms and reluctance to bloom. These plants flourish in sunny windowsills as long as the heat remains near 75 degrees. However, moving a wilting plant from a shady location directly into full sunlight can shock the plant. Gradually acclimate a wilting orchid by placing it in sunlight for a few hours each day. Like many tropical exotics, orchids require even soil moisture at all times. Orchids in full bloom tend to require more water than orchids with only foliage. Providing additional water during the flowering season discourages wilting due to dehydration. A pot with good drainage holes and a layer of sphagnum moss over the loamy soil ensures sufficient moisture and adequate drainage. Although most orchids come from the nursery potted in rich, nutritious orchid media, continued growth can deplete the soil of nutrients. Applying a diluted fertilizer once each week during the flowering season will encourage healthy, long-lived blossoms. Select a fertilizer labeled for use on orchids and follow the label instructions for mixing and applying the plant food.